With engines revving and gravity-defying courses awaiting, the Mushroom Kingdom’s finest racers are set to line up on the starting grid on 30th May 2014 when Mario Kart 8 launches on Wii U. 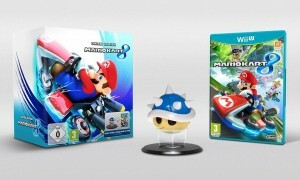 But in the meantime, whether or not you know your Blooper from your Bullet Bill, Nintendo has today announced two options to get your karting skills up to speed in the form of the Mario Kart 8 Limited Edition software bundle and a Super Mario Kart promotion coming to Nintendo eShop for Wii U on 27th March 2014. Mario Kart fans who have ever unleashed a Spiny Shell item or been on the wrong side of one will know of their capacity to make or break a race, therefore as a memento of times both good and not so good, the Mario Kart 8 Limited Edition software bundle will come complete with a Spiny Shell Collector’s Item alongside a physical copy of Mario Kart 8, with the Spiny Shell proudly perched atop a black and transparent frame. Packaged together as a uniquely designed bundle, the Mario Kart 8 Limited Edition launches on 30th May 2014 and is ready for pre-order now from the Nintendo UK Online Store and selected retailers, available while stocks last. Customers in the UK & Ireland who have already pre-ordered the standalone copy of Mario Kart 8 will have the opportunity to upgrade pending availability. One of the most devastating items found in-game, expect to see the Spiny Shell back in its natural environment knocking champion racers off the podium when the item appears in the Mario Kart franchise once more from 30th May 2014. Meanwhile, for fans wishing to keep their kart tyres warm and reactions sharp before 30th May 2014, the Super Nintendo classic Super Mario Kart will release on Nintendo eShop as a Wii U Virtual Console title on 27th March 2014. As part of a promotion to celebrate both this legendary title and Mario Kart 8, fans who purchase Super Mario Kart on Nintendo eShop from its release until 30th June 2014 can get a discount of £5.49 on Mario Kart 8 if they choose to purchase Mario Kart 8 on Nintendo eShop from the release of the game until 30th June 2014, providing the purchase takes place on the same Wii U console. As an added extra for those who pre-order – at retail – either the Mario Kart 8 Limited Edition software bundle or Mario Kart 8 as a standalone game, Mario Kart-themed keyrings will be available for fans from selected outlets. Whether satisfying a need for speed with the Golden Dash Mushroom, knocking over rival drivers with a Red Shell, or temporarily bulldozing through a course in the form of a Bullet Bill, the keyrings on offer will represent some of the most memorable items from the Mario Kart franchise. Gravity-defying courses and Mushroom Kingdom racers both old and new come together on 30th May when Mario Kart 8 launches on Wii U. To catch an accelerated glimpse of what lies in store, a new Mario Kart 8 Limited Edition CGI trailer is now available to view, featuring an appearance from the formidable Spiny Shell plus many a character you may have come to know over the years!